Ladies and gentlemen, let us begin with a riddle. I am seven feet tall, 150 pounds stuffed, sleek, blue, provocative, and undeniably phallic. I contain civil disobedience, sweet soothing sonnets, a manifesto, at least 600 brainchildren, and the ashes of four human beings and two dogs. I have journeyed more than 10,000 miles wrapped in blankets, on the floor of an old Ford Econoline van, and I have visited Mars—well, metaphorically at least. I was purchased on Craigslist, in the dead of night, for one hundred dollars. I am riddled with bullet holes, and my fins are bent. I have provoked confusion, consternation, and celebration wherever I have gone. Are you hovering on the edge of your seats? Good. Now, hold that thought a moment. To be human is to dream. After all, everyone has a dream: to vacation in Maui, to own his own home, to win the Powerball…but outlaw poet and rabblerousing ruffian S.A. Griffin had an unusual dream: "for a long time, I wanted to put poetry inside of a bomb. So I did it." And so he said, "let there be Elsie. The Poetry Bomb." And there was Bomb, and he saw it, and he said that it was good. what was the Poetry Bomb? did Griffin just lift it right out of thin air? Fear not! In order to unearth the answers to these needling questions, I personally got in touch with the creator himself—via burning bush—to make sense of Elsie, the Poetry Bomb. While S.A. Griffin may not be as enigmatic as the Poetry Bomb itself, he does, like the Bomb, defy easy classification. As he has strutted and fretted his hour upon the stage, Griffin has worn innumerable hats: as Air Force serviceman, lead singer, poet ("Whorehunter"), film actor (World Trade Center), editor (Outlaw Bible of American Poetry), DJ, teacher, general rabblerouser, and head honcho of the Carma Bums, a beatnik performance poetry troupe. Given this exhausting list, it's hard to believe the man ever slows down long enough for a conversation. 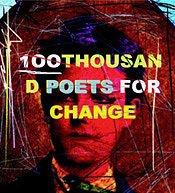 However, I recently caught hold of the creative hurricane in between projects in order to speak with him about his newest title—"purveyor of Poetry Bomb." Warm, philosophical, and undeniably Californian, Griffin generously shared with me the tales and tribulations behind the Poetry Bomb project. Though it's near impossible to do justice to either Bomb or Bomb-maker in dry written word—Griffin's answers practically scream out for CAPS, italics, extra punctuation!? !—I here humbly offer the gleanings of our conversation, or, Brave New Bomb. 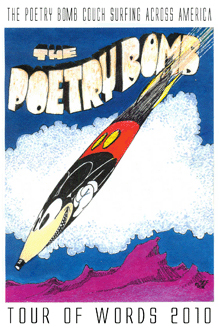 And so, dear reader, I will begin with your first query: what was the Poetry Bomb? The Poetry Bomb is, quite literally, a bomb filled with poetry. And what a bomb it is. According to Griffin, "it weighs about 100 pounds empty…about 150 pounds with the poetry. It's a seven foot tall, a foot and a half wide, hundred pound MK 4 1970 Viet Nam era practice bomb." And, he proudly informs me, this bomb ain't just for show either. "We know it was actually used, because the fins are bent, and there's a big flat surface near the top where it hit the ground and then rolled." How about the poetry? "There are about 500-600 pieces [inside of it] now…poems by people from the ages of three to ninety from all over the world." Onward and forward, to your second—and, perhaps, more important question: why was it there? Well, to travel across America, of course. During the spring and summer of 2010, Griffin travelled 10,000 miles, from LA to Phoenix to Chicago and back, exhibiting the Bomb wherever he went. But why build the Poetry Bomb in the first place? S.A. Griffin: I have no idea. On the tour, I'd often say, in performance that, just like, 'where do babies come from?' and 'where do we go when we die?' who the hell knows?…I wanted to inspire people to communicate with one another and do something…[And] in a sense, you could say [that] I was utilizing the object as an object lesson. That is to say, 'can we keep pace ethically with what we create?' And the answer is always no. Listening to Griffin wax philosophical about the Poetry Bomb, various images—bomb photos past—come trotting, uninvited, through my mind. First, I recall an image I once saw in a newspaper somewhere. In the photo, a maimed child stares directly out of the frame. He winces with pain, eyes pleading—for something, anything—as an unseen nurse tends the bloodied stumps that were once his arms. I try to shake my mind to clear the image, but it lingers, burned into my memory. Just as suddenly, my mind shifts, focussing upon a new remembered image. It's an iconic 1940s photo: the black-and-white shot of the atomic bomb watchers. In the image, a dozen or so men, smartly dressed in matching military uniforms, sit quietly in neat rows of Adirondack chairs, all facing the same direction. Legs crossed, faces expressionless, the men watch through their dark sunglasses as the most destructive device ever known to mankind is detonated. Mulling this image, I am shaken by the absolute disconnect between the watchers and the bomb. How can they possibly look so casual in the face of the bomb?, I wonder. What if, for instance, instead of watching the bomb explode, they were staring directly at the first image, that of the little boy—the effect of their blessed bomb…would they still look so blank and indifferent? I drift back to the conversation at hand and realize, of course, that Griffin is right. We cannot keep pace ethically with what we create. I realize, too, why Griffin chose a bomb as the vessel for his project: what, after all, could be more provocative than a bomb? Love it or loathe it, fear it or fawn over it, everyone has strong feelings about a bomb. But not necessarily the same feelings. According to Griffin, that's exactly the point. S.A. Griffin: You see, the project, it's about disagreements. The thing is, the bomb was invented to create and enforce agreements. And so this Bomb, the Poetry Bomb—it's about disagreements. About embracing disagreements. All right, so that answers the what and the why of Elsie. But where did the Poetry Bomb come from, anyway? (Did Griffin just lift it right out of thin air?) Appropriately, the Poetry Bomb's genesis was, well, epic, man. That day, the guy sold Griffin the bomb for a hundred bucks, delivering it straight to his door. And the rest, as they say, is history. But that's not all. Fatefully enough, the seller said that, once he had posted the listing for the bomb on Craigslist, Griffin emailed him 10 seconds afterwards. Here Griffin takes a rare pause, contemplating it all: "that's the kind of thing that makes me say, all along, it's just been a parade of saints and angels, man." When pressed, he explains, "I mean, there have been so many people just helping and supporting me to complete this project. It's amazing." And so, by November 5, 2009, Griffin was a poet with a plan and a bomb. The time had arrived to prepare the bomb for the tour, or, as I like to think of it, Pimp My Bomb. With a little help from his friends, Griffin opened up the Bomb, cleaned it out, reassembled it, and began asking people to submit poetry—original poems, or simply favorite poems—to fill the Bomb. Thanks to an article in the AP, as well as Facebook, Griffin's call for submissions went viral; the project exploded from there. 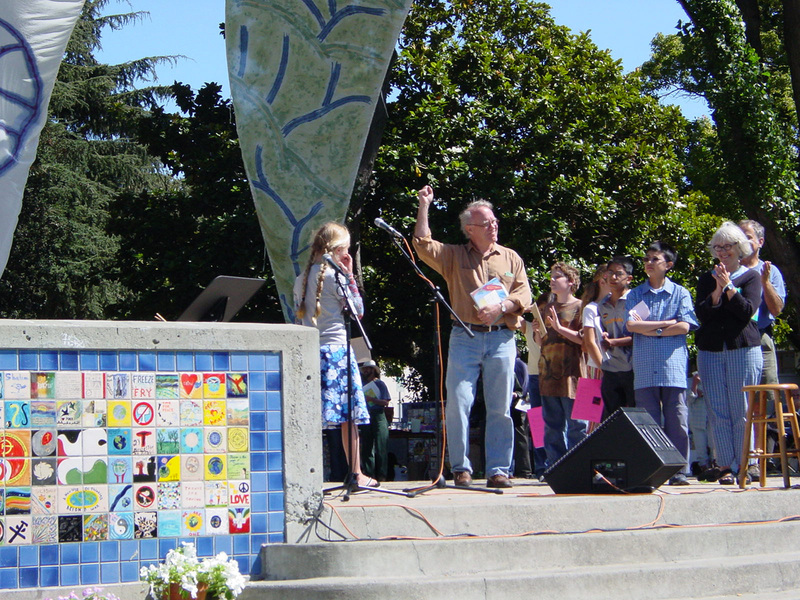 Once the Bomb was full, Griffin fitted the Bomb with a small window that could open and shut, thus enabling him to take poems out of the Bomb to read aloud at performances. 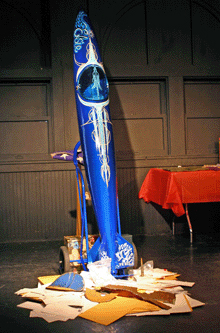 He then gave the Bomb a premium paint job worthy of one of the classic muscle cars he collects: shiny, blue, pinstriped. Finally, he painted the Bomb with the motto "Verba Sine Finis"—words without end. Painted, poetic, and trip-ready, the Bomb lacked only one thing: a moniker. Without hesitation, Griffin named the Bomb Elsie, after his grandmother Elsie Emerson: "[his] own personal saint and angel." Elsie premiered—perhaps appropriately—on April Fool's Day, at Skylight Books in Los Angeles. In honor of the Poetry Bomb's debut, Frank T. Rios "burned the poem and performed the invocation, sending Elsie off into the great big world to do her thing, to hopefully throw a little light into a dark world in the service of the muse." From there, Griffin and Elsie embarked on an incredible journey, covering 10,000 miles over five weeks, speaking at thirty-two venues, from libraries to bookstores to high schools to coffeeshops. In fact, they "even went out in front of the Parthenon in Nashville" and performed there. Each performance was, essentially an open reading. First, Griffin would "give [his] spiel" and begin by reading Gregory Corso's "Bomb," a piece that he considers to be one of the greatest poems of the twentieth century. After that, "people would come up and read. The way it was designed, no one paid admission, and everyone participated." Unsurprisingly, everyone reacted differently to the Bomb. Griffin explains that "a lot of people didn't get it at all." However, lots of other people seemed to be "pleasantly surprised, pleasantly shocked." His theory? "People are human. People want something to believe in. And so, in a way, I would say that the Bomb helped them believe in themselves." Of course, the trip was not without its share of (real or near) mishaps. For instance, Griffin recounts, "sometimes I'd show up and nobody'd know what I was there for. At one gig, the guy who booked it had no idea I was bringing the Bomb. I [walked] in, and he was like, 'what's that?' [and I said] 'it's the Bomb, man. Didn't you read the email?'" Megan McCrea: Did you have any concerns going into the trip? S.A. Griffin: [Yes,] one was being pulled over by the cops, and one was having an accident. People told me, 'well just mount [the Bomb] on the roof of your car. I'm thinking, 'are you serious? What if I get in an accident on the highway? Then we'll have a literal bomb on our hands. For this reason, Griffin bought an Econoline van just for the tour. Conveniently, the Bomb fit perfectly between the seats. S.A. Griffin: Anyway…at the Texas/New Mexico border, they [did] check us out really heavy, but [nothing happened]. And it's not like we were trying to hide the thing. I mean, it was wrapped in blankets, but there we are, driving around with all the shades up, but no one checked out the Bomb. They shined a light on it, but they never asked what it was. I'll tell you, saints and angels, man. But the Poetry Bomb's triumphs didn't end there. Griffin tells me that, in Memphis, "this one woman wrote a little piece right there, on the spot." Evidently, she and her husband, one of them had made an organ donation to the other and saved that person's life. "That was cool." When I ask him about the future of the Bomb, Griffin bubbles over with enthusiasm. "It's [far] from over," he assures me. "I want everyone to be inside the Bomb." In his view, the project will not be finished until the Bomb is completely filled with poetry. Megan McCrea: And how many more poems will that be? And what will happen when it's full? Griffin trails off, clearly lost in reverie as he looks toward the future. For now, Griffin is quite content with Elsie's progress. When I ask whether he considers the Poetry Bomb a success, he unabashedly answers: "Totally. It's pretty much everything I imagined it would be. It's beautiful…And has it affected people? Yeah. It's taken the poem off of the page and reached people." And, after all, isn't that what it's all about? Griffin tells me that, often, people will approach him, asking, "'S.A., is poetry relevant?' I explain to them that theology, history—[it's all] been passed down through poetry. So poetry is elemental, that's why people take it for granted. It's elemental, like air." So poetry shall continue, but what of the Bomb? If we are to believe Gregory Corso, the bomb, too, is far from over. As he writes near the end of "Bomb,"
Let us hope that they are all as beautiful and inspiring as Elsie. Amen. Megan McCrea is an editorial assistant at Poetry Flash. A freelance editor and writer, she studied Theater and Engish at Duke University. A former Peace Corps volunteer, she co-authored Discover the Real Micronesia & Palau, a travel guidebook.